Which is the Biggest Hit of Them All? The race is on. Is it Bahubali 2? Or is it Dangal? Which is the biggest Indian hit film of all time? For a brief period, it looked that Bahubali 2 with a worldwide business of more than Rs 1,500 crore, would take the top slot. Until Dangal opened in China. The movie has done a worldwide business of close to Rs 1,700 crore, with around Rs 900 crore coming from China alone. This means that Dangal is the biggest Indian hit film of all time. Ironically, Bahubali 2 with collections of close to Rs 500 crore in Hindi, is the biggest hit in Hindi cinema (originally made in Telugu it has been dubbed into Hindi) of all time. Dangal made a little over Rs 387 crore in Hindi. On an all India basis Bahubali 2 did greater business than Dangal. Hence, within India Bahubali 2 is the biggest hit of all time. There are many things that this analysis does not take into account. The first and foremost is the fact that no one is looking at the return on investment. If a film made on a budget of Rs 15 crore does a business of Rs 60 crore, it earns a return of 300 per cent. In comparison, if a film made on a budget of Rs 100 crore does a business of Rs 200 crore, it makes a return of only 100 per cent, even though the overall business that it does is certainly more. Hence, just measuring the revenue of a film gives a misleading picture. But this is the way analysis happens. This convolutes the overall picture in favour of films doing big business, even though their return on investment may not be necessarily high. The second point is inflation. 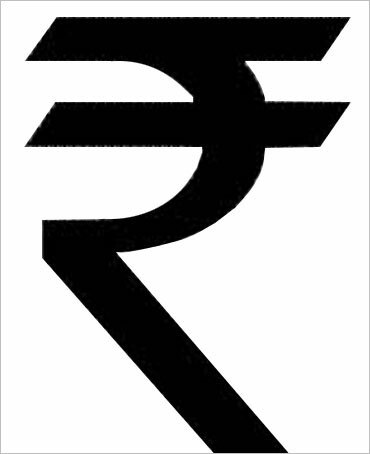 The value of the rupee today is not the same as it was 50 years back or 20 years back or even a year back. Ticket prices have gone up over the years. In fact, in large parts of the country, film ticket prices have gone up much faster than the overall rate of inflation. When I was in college in the mid to late 1990s, the most expensive ticket was around Rs 11. Even if we assume a rate of inflation of 8 per cent per year over the last two decades, Rs 11 then is now worth around Rs 51. In the big cities, where much of the film business happens, Rs 51 is simply not enough to buy a film ticket. Hence, films now make much more money than they did in the past because tickets even after adjusting for inflation are more expensive than they used to be. How does this number look if we were to take inflation into account? Chaudhuri estimates the prices have gone up eighteen times since 1975. This “would put just the domestic gross collection of Sholay at Rs 450 crores.” A price increase of 18 times over four decades means a rate of inflation of around 5.3 per cent. This is just adjusting for inflation. If we take into account the excessive increase in ticket prices in comparison to overall inflation, Sholay would have made much more than Rs 450 crore, if we were to adjust for today’s reality. It would have definitely made more than Bahubali 2 has in its first run in Hindi. Also, this does not take into account the fact that Sholay continued to earn money over the years, as it kept getting re-released. Now that is something that doesn’t happen anymore with most money being made in the first few weeks of the film’s release. If we see the situation from this lens, things suddenly don’t seem like they are being projected. The column originally appeared in the Bangalore Mirror on May 31, 2017. The Reserve Bank of India released its annual report earlier this week. The report had some important data points which I shall discuss in this piece. Let’s try and understand GNDI in a little more detail. It is essentially the sum of the gross domestic product (a measure of national income) plus remittances (money transfer carried out by migrant workers to their home country) plus money/food received as a part of an international assistance programme plus the net primary income. Net primary income is essentially the “difference between the primary income receivable from non-residents and the primary income payable to non-residents”. As per the paper, India’s GNDI is around 1.03 times its gross domestic product. The household financial savings comprise of currency, deposits, shares and debentures, insurance funds, pension and provident funds and something referred to as claims on government. The claims on government largely reflects of investments made in post office small savings schemes. The household financial savings have gone up to 7.7 per cent of GNDI in 2015-2016. This is a five-year high. Why has this happened? The simple reason for this lies in the fact that the rate of inflation has been lower in 2015-2016 than it was in the earlier years. 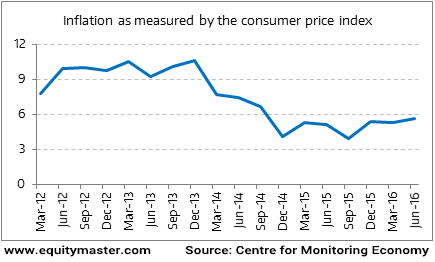 As the chart shows, the rate of inflation as measured by the consumer price index has shown a downward trend between December 2013 and September 2015. Since then the rate of inflation has gone up a little. The point is that when the rate of inflation goes down (i.e. there is disinflation) people have a chance of saving a greater portion of their income and that is what seems to have happened. Lower rates of inflation have led to higher household financial savings. The inflation as measured by the consumer price index peaked at 11.5 per cent in November 2013. It collapsed to 4.3 per cent in December 2014 and it averaged under 5 per cent through 2015. Both the Narendra Modi government and the Reserve Bank of India governor Raghuram Rajan deserve credit for this. The Modi government for managing food inflation by not increasing the minimum support price on rice and wheat at the same rapid rate as it had been raised in the past (although this had started during the last year of the Manmohan Singh government) and Rajan for managing inflationary expectations (or the expectations that consumers have of what future inflation is likely to be). In fact, things get interesting if one looks at the breakup of the household financial savings. In 2011-2012, deposits formed the bulk of the savings. They stood at 6 per cent of the GNDI. By 2015-2016, this had fallen to 4.7 per cent of the GNDI. What is happening here? This clearly shows that most people who invest in deposits (of banks or otherwise) are victims of money illusion. In 2011-2012 and 2012-2013, the nominal interest rates on bank deposits where close to 9-10 per cent and so was the inflation as measured by the consumer price index. This clearly meant that people were losing purchasing power on the money invested in deposits. The inflation since then has fallen to around 5-6 per cent. The interest rates on bank deposits has fallen to around 7-7.5 per cent. Nevertheless, depositors are now making a real rate of return on their deposits because the rate of interest on deposits is greater than the rate of inflation. This clearly wasn’t the case earlier, and the depositors were essentially losing purchasing power by staying invested in deposits. This explains why people have moved away from deposits. The falling nominal rates have led to them shifting their investment to other avenues even though the nominal return on deposits is now in positive territory. Take a look at the claims on government. This has jumped from almost nothing to 0.4 per cent of GNDI. This basically means that the smarter lot has moved their money to small saving schemes where the nominal rate of interest as of now is higher than the interest on offer on fixed deposits. Investments in shares and debentures has also jumped up from 0.4 per cent to 0.7 per cent of GNDI. This should make the finance minister Arun Jaitley happy. He complained some time back that people invest so much money in fixed deposits while ignoring other forms of investing like shares, debentures and mutual funds. Currency holdings have also jumped from 1.1 per cent of GNDI to 1.4 per cent of GNDI. I really do not have an explanation for this. Why would people want to hold money in a form where they don’t get paid any interest? The other interesting thing that comes out of the chart is that the gross household financial savings have risen to 10.8 per cent of GNDI in 2015-2016, from 10 per cent in 2014-2015. This has translated into the net household financial savings going up to 7.7 per cent of GDP in 2015-2016 from 7.5 per cent in 2014-2015. Why is there such a substantial difference between the jump in gross household financial savings and the jump in net household financial savings? The net household financial savings figure is obtained by subtracting financial liabilities from the gross household financial savings. The financial liabilities in 2015-2016 have jumped to 3 per cent of GNDI, in comparison to 2.5 per cent in 2014-2015. This basically means that people borrowed more in 2015-2016 than was the case in the past. In fact, at 3 per cent of GNDI, the financial liabilities are not significantly different from the 3.2 per cent figure of 2011-2012 and 2012-2013. This basically tells us that households borrowing is alive and kicking. These numbers are again an answer to those who keep demanding that the RBI cut the repo rate at a much faster rate than it has. The trouble is clearly with corporate borrowing which continues to remain in a mess, and there is not much (and it shouldn’t) that the RBI can do about ensuring that banks lend to corporates. Take a look at the following chart. It shows the various kinds of savings that made up for household financial savings in 2013-2014 (the latest data that is available on this front). Deposits constituted close to 63.3 per cent of the total household financial savings. Banks deposits formed around 56.7 per cent of the total household financial savings. Hence, bulk of the Indian savings are in the form of deposits in general and bank deposits in particular. Shares and debentures formed around 1.5 per cent of the total household financial savings. Within that, investment in mutual funds constituted around 0.98 per cent of total household financial savings. Further, investment in shares and debentures of private corporate companies constituted around 0.46 per cent of total household financial savings. What this tells us very clearly is that the Indian financial media spends a disproportionate amount of time and space, discussing stocks, debentures and mutual funds. A very small segment of India’s population actually invests in them. This also largely explains why the pink newspapers in India, have such small circulation numbers, given that most of the stuff they publish remains irrelevant to a large section of the population. What the above chart clearly tells us is that deposits are the main form of savings in India. First and foremost, these deposits help both the union as well as the state governments in India. It is mandatory for banks to invest a certain proportion of their deposits in government bonds (i.e. bonds issued both by the union government as well as the state governments). The statutory liquidity ratio as this ratio is referred to as is currently at 21 per cent. Hence, for every Rs 100 raised as deposits, banks need to invest at least Rs 21 in government bonds. As on August 5, 2016, 29.3 per cent of aggregate deposits of banks were invested in government bonds. With so much money chasing government bonds, it allows the union government to raise money at a lower rate of interest than would have been the case, if it was not compulsory for banks to invest in government securities. Over and above the banks, the provident funds as well as the insurance companies also need to compulsorily buy government bonds. This allows the government to raise money at lower interest rates, than would have otherwise been the case. Further, given that deposits are the main form of savings, it is this money invested by deposit holders with banks, that ultimately finds its way into the lending carried out by banks. It finances almost everything from homes to cars to two-wheelers to credit card spending to infrastructure projects to corporate takeovers. But for all that they do as a whole, the deposit holders don’t get treated well. In fact, rarely do they even get a rate of interest on their deposits, which is higher than the rate of inflation. Take a look at the following chart. 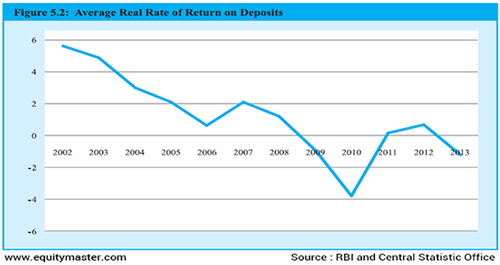 It shows that between 2009 and 2013, the interest rate on fixed deposits was lower than the rate of inflation. This basically meant that the purchasing power of the money invested in deposits, had been going down. Between mid-2014 and now, the rate of interest offered on fixed deposits of one year or more, has been higher than the rate of inflation. But in the recent past, this gap has started to narrow again. Also, for those in the higher tax brackets, the real rate of return after paying tax on interest that they earn on fixed deposits, must already be in the negative territory. The real rate of return is essentially the difference between the nominal rate of interest on a fixed deposit minus the rate of inflation. One of the ironies of the Indian tax system is that income that is earned as capital gains is either not taxed at all, or taxed at lower rates, than income which is earned as an interest on a fixed deposit. Further, capital gains made on selling a house or a debt mutual fund are even allowed the benefit of indexation. The question is why are fixed deposit investors not allowed the benefit of indexation as well, while paying taxes? Indexation basically allows to take inflation into account while calculating the price of acquisition of an asset. This essentially ensures that the capital gains come down. And in the process, so does the tax that needs to be paid on the capital gains. Such benefits are not available to those who invest in fixed deposits. If all this was not enough, politicians and bureaucrats keep talking about the need for lower interest rates all the time. This is something I discussed in yesterday’s column, where the commerce and industry minister, Nirmala Sitharaman, had talked about the need to lower interest rates by 200 basis-points to help the micro, small and medium enterprises(MSME) sector. The finance minister Arun Jaitley has in the past on multiple occasions talked about the need for lower interest rates on fixed deposits. In fact, sometime back, Jaitley even said that people should be investing their money in mutual funds, bonds and shares, that finance projects and lead to economic activity. As if fixed deposits do not finance economic activity. For the finance minister of the nation to be saying something as remarkably silly as this, is surprising indeed. As I explained earlier in the piece, fixed deposits are ultimately loaned out by banks and this creates economic activity in the process. The money invested in fixed deposits is also invested in government bonds which finance the government. Government bonds essentially help finance the fiscal deficit. Fiscal deficit is the difference between what a government earns and what it spends. The money spent by the government also creates economic activity. Hence, saying that fixed deposits do not create economic activity is totally incorrect. Also, fixed deposits need to offer a real rate of return. One reason for this is that they are used by senior citizens to generate a regular income. In a country, where there is very little social security on offer along with the fact there is almost no specialised care for the elderly and a medical system which basically robs everyone, the least that we can do is to ensure that the interest on fixed deposits is higher than the rate of inflation. Also, as I keep saying deposits are also used to build a corpus for retirement and weddings and education of children. Given the reasons cited above, it is important that the government treated the deposit investors with some respect and not make them the fall guy, all the time. The commerce and industry minister Nirmala Sitharaman wants the Reserve Bank of India(RBI) to cut the repo rate by 200 basis points. The repo rate is the rate at which banks borrow from the RBI on an overnight basis. One basis point is one hundredth of a percentage. The repo rate currently stands at 6.5 per cent. “I still hold that the cost of credit in India is high. Undoubtedly, particularly MSMEs which create a lot of jobs contribute to exports… are all hard pressed for money and for them, approaching a bank is no solution because of the prevailing rate of interest. I have no hesitation to say, yes 200 bps, I would strongly recommend,” Sitharam told the press yesterday in New Delhi. What Sitharaman was basically saying is that India’s micro and small and medium enterprises(MSMEs) are not approaching banks for loans because interest rates are too high. Given this, the RBI should cut the repo rate by 200 basis points and in the process usher in lower interest rates for MSMEs. This, according to Sitharaman, was important because MSMEs create a lot of jobs and contribute to exports, and hence, should be able to borrow at a lower interest rates, than they currently are. As per the National Manufacturing Policy of 2011, the small and medium enterprises contribute 45 per cent of the manufacturing output and 40 per cent of total exports. Hence, Sitharaman was batting for the MSMEs. But is it as easy as that? That politicians don’t understand economics, or at least pretend not to understand it, is a given. 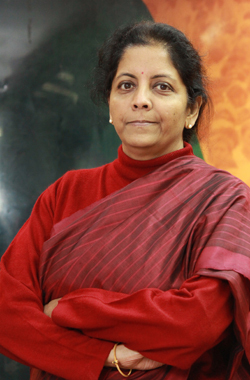 But Sitharaman is a post graduate in economics from the Jawaharlal Nehru University in Delhi. (You can check it out here). For her, to make such an illogical remark, is rather surprising. Not that the RBI is going to oblige her, but for a moment let’s assume that it does, and cuts the repo rate by 200 basis points, in the next monetary policy statement, which is scheduled for October 4, 2016, or over the next few statements. What is going to happen next? Will banks cut their lending rates by 200 basis points? Only, when the banks cut their lending rates by 200 basis points, is the MSME sector going to benefit. Banks only borrow a small portion of money from the RBI on an overnight basis and pay the repo rate as interest. A major portion of the money that they lend is borrowed in the form of fixed deposits. Hence, lending rates cannot fall by 200 basis points, unless fixed deposit interest rates fall by at least 200 basis points. (I use the word at least because banks tend to cut deposit rates faster than lending rates). Wil the banks cut deposit rates by 200 basis points? Let’s assume that they do. If the deposit rates are cut by such a huge amount at one go, people will not save money in fixed deposits. Money will move into post office savings schemes, which offer a significantly higher rate of interest in comparison to fixed deposits (which they do even now, but with a cut the difference will be substantial). Over a longer period of time, money will also move into real estate and gold, as people start looking for a better rate of return, higher than the prevailing inflation. This will lead to the financial savings of the nation as a whole falling. And banks in order to ensure that deposits keep coming in, will have to reverse the 200 basis points cut and start raising interest rates. This is precisely how things played out between 2009 and 2013, when household financial savings fell from 12 per cent of the GDP to a little over 7 per cent of the GDP. Meanwhile, the interest rates went up, in order to attract financial savings. This is Economics 101, which a post graduate in economics from a premier university in the country, should be able to understand. Another important issue that our politicians seem to forget, over and over again, is the importance of fixed deposits, as a mode of saving, in an average Indian’s life. 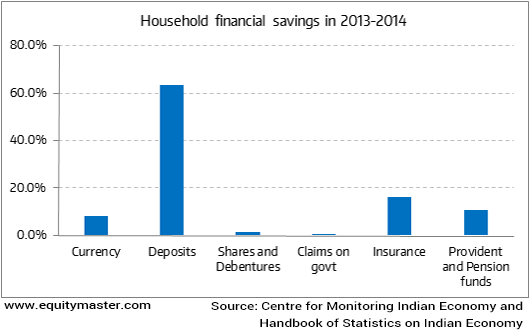 In 2013-2014, the latest year for which data is available, 69.23 per cent of total household financial savings, were in deposits. Of this nearly 62.02 per cent was with scheduled commercial banks and 4.19 per cent with cooperative banks and societies. Nearly 2.61 per cent was invested in deposits of non-banking companies. What does this tell us? It tells us that for the average Indian, the fixed deposit is an important form of saving. For the retirees it is an important form of regular income. Now what happens if fixed deposit interest rates are cut by 200 basis points? The regular income from the fresh money that retirees invest, will come down dramatically. Also, when their old fixed deposits mature, they will have to be invested at a significantly lower rate of interest. This means that they will have to limit their consumption in order to ensure that they meet their needs from the lower monthly income that their fixed deposits are generating. What about those who use fixed deposits as a form of saving? (I know that fixed deposits are a terribly inefficient way of saving, but that is really not the point here). Those who are using fixed deposits to save money, for their retirement, for the education and wedding of their children, will now have to save more money, in order to ensure that they are able to create the corpus that they are aiming at. This will also mean lower consumption. Ultimately lower consumption will impact MSMEs as well, because there won’t be enough buyers for what they produce, as people consume less. Those individuals who are not in a position to save the extra amount in order to make up for lower interest rates, will end up with a lower corpus in the years to come. The point being that MSMEs do not operate in isolation. And the level of interest rates impacts the entire economy and not just the MSMEs, as Sitharaman would like us to believe. Further, even if fixed deposit rates fall by 200 basis points, banks may still not be able to offer low interest rates to MSMEs, simply because they need to charge a credit risk premium i.e. factor in the riskiness of the loan that they are maing. In case of the State Bank of India, the gross non-performing assets of SMEs stands at 7.82 per cent, as on March 31, 2016. This means that for every Rs 100 that the bank has lent to an SME, close to Rs 8 has been defaulted on. This risk of default needs to incorporated in the interest rate that is being charged. And finally, the interest rates on fixed deposits of greater than one year are currently in the region of 7 to 7.5 per cent. This is when the rate of inflation has already crossed 6 per cent. In July 2016, the rate of inflation as measured by the consumer price index was at 6.07 per cent. If fixed deposit rates are cut by 200 basis points, the interest rates will fall to around 5 to 5.5 per cent. This when the rate of inflation is greater than 6 per cent. This would mean that the real rate of interest (the difference between the nominal rate and the rate of inflation) would be in a negative territory. This is precisely how things had played out between 2009 and 2013 and look at the mess it ended up creating for the Indian economy. Given these reasons, it is best to say that Sitharaman’s prescription would be disastrous for the Indian economy. On Saturday, August 20, 2016, the Narendra Modi government appointed Urjit Patel, as the 24th governor of the Reserve Bank of India(RBI). He will take over fromRaghuram Rajan, on September 4, 2016. Since Patel’s appointment two days back, a small cottage industry has emerged around trying to figure out what his thinking on various issues is. The trouble is that Patel has barely given any speeches, or interviews, for that matter, since he became the deputy governor of the RBI, in January 2013. A check on the speeches page of the RBI tells me that he has given only one speech (you can read it here) and one interview (you can read it here) in the more than three and a half years, he has been the deputy governor of the RBI. You can’t gauge much about his thinking from the speech which is two and a half pages long. As far as the interview goes, Patel has answered all of three questions. Some of his thinking can be gauged from the Report of the Expert Committee to Revise and Strengthen the Monetary Policy Framework¸ of which he has the Chairman. The report was published in January 2014 and ultimately became the basis for the formation of the monetary policy committee, which will soon become a reality. There are also a few research papers that he has authored over the years. Given this, Patel’s thinking on various issues will become clearer as we go along and as he interacts more with the media in the days to come. While he may have managed to avoid the media in his role as the deputy governor that surely won’t be possible once he takes over as the RBI governor. He may not make as many speeches as his predecessor did (which is something that the Modi government probably already likes about him), but there is no way he can avoid interacting with the press, after every monetary policy statement, and giving interviews now and then. Given this, the policy continuity argument being made across the media about Patel being appointed the RBI governor, is rather flaky. There isn’t enough evidence going around to say the same. The only thing that can perhaps be said from what Patel has written over the years is that his views on inflation seem to be in line with Rajan’s thinking. Also, some of the stuff that is being cited was written many years back. And people do change views over the years. There is no way of knowing if Patel has. While, his thinking on various issues may not be very clear, it doesn’t take rocket science to figure out what his bigger challenges are. Take a look at the following chart. 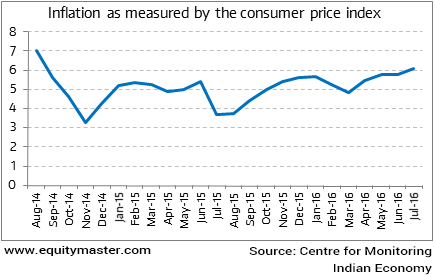 It maps the inflation as measured by the consumer price index since August 2014. The chart tells us very clearly that the inflation as measured by the consumer price index is at its highest level since August 2014. In August 2014, the inflation was at 7.03 per cent. In July 2016, it came in at 6.07 per cent. Why has the rate of inflation as measured by the consumer price index, spiked up? 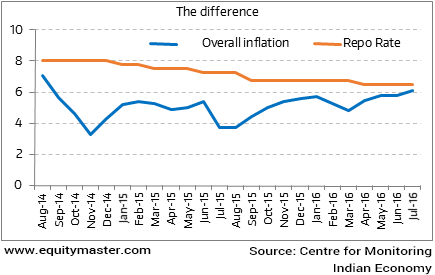 The answer lies in the following chart which shows the rate of food inflation since August 2014. Like the inflation as measured by the consumer price index, the rate of food inflation is also at its highest level since August 2014. In August 2014, the food inflation was at 8.93 per cent. In July 2014, the food inflation was at 8.35 per cent. 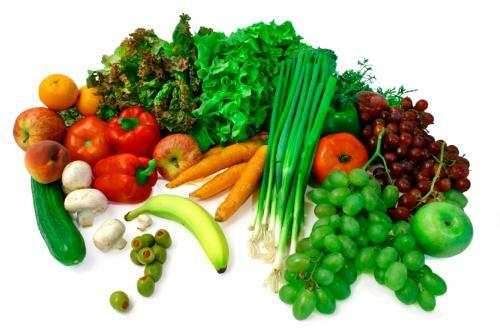 Food products make for a greater chunk of the consumer price index. What this tells us is that the inflation as measured by the consumer price index spikes up when the food inflation spikes up. And that is the first order effect of high food inflation. This becomes clear from the following chart. But what can the RBI do about food inflation? There is not much that the RBI can do about food inflation. And this is often offered as a reason, especially by the corporate chieftains and those close to the government (not specifically the Modi government but any government), for the RBI to cut the repo rate. The repo rate is the rate of interest that the RBI charges commercial banks when they borrow overnight from it. It communicates the policy stance of the RBI and tells the financial system at large, which way the central bank expects interest rates to go in the days to come. The trouble is that things are not as simplistic as the corporate chieftains make them out to be. While, the RBI has no control over food inflation (and not that the government does either), it can control the second-order effects of food inflation. Given this, the entire logic of the RBI cutting the repo rate because it cannot manage food inflation is basicallybunkum. Food inflation inevitably translates into overall inflation and that is something that the RBI has some control over, through the repo rate. If this is not addressed, second order effects of food inflation can lead to an even higher inflation as measured by the consumer price index. And this will hurt a large section of the population. But one cannot expect corporate chieftains who have taken on a huge amount of debt over the years, in order to further their ambitions, to understand this rather basic point. Given this, this hasn’t stopped them from demanding a repo rate cut from the new RBI governor. (You can read more about it here). 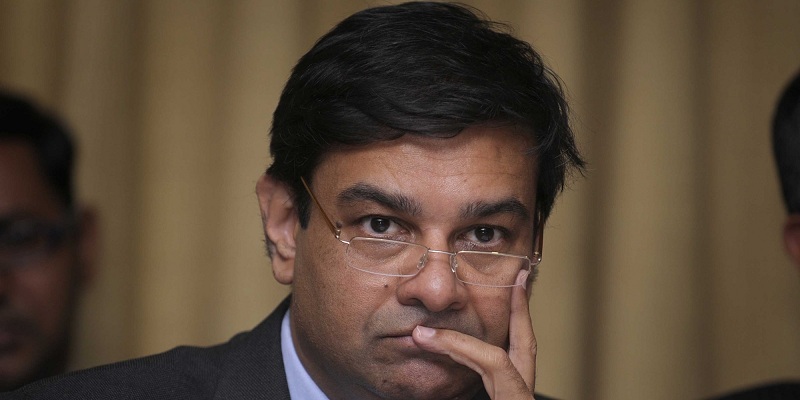 The government has also made it clear over and over again that it wants the RBI to cut the repo rate. Given that, it is the biggest borrower, this is not surprising. Since January 2015, the RBI has cut the repo rate by 150 basis points to 6.5 per cent. One basis point is one hundredth of a percentage. The people who invest in deposits unlike the corporate chieftains are not in a position to lobby. But it is important that the RBI does not forget about them. Hence, it is important that people are offered a positive real rate of interest on their fixed deposits. The real rate of interest is essentially the difference between the nominal rate of interest offered on fixed deposits and the prevailing rate of inflation. A positive real rate of interest is important in order to encourage people to save and build the domestic savings of India, which have been falling over the last few years. This was one of the bigger mistakes made during the second-term of the Manmohan Singh government. 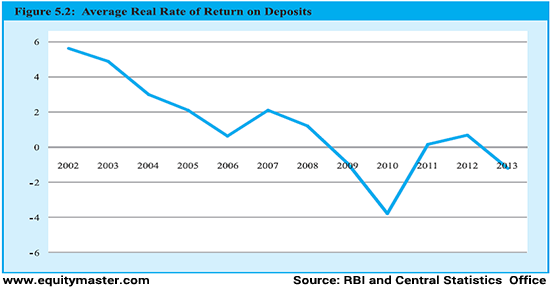 Take a look at the following chart clearly shows that between 2008 and 2013, the real rate of return on deposits was negative. In fact, it was close to 4 per cent in the negative territory in 2010. High inflation essentially ensured that India’s gross domestic savings have been falling over the last decade. Between 2007-2008 and 2013-2014, the rate of inflation as measured by the consumer price index, averaged at around 9.5 per cent per year. In 2007-2008, the gross domestic savings peaked at 36.8 per cent of the GDP. Since then they have been falling and in 2013-2014, the gross domestic savings were at 30.5 per cent of the GDP, having improved from a low of 30.1 per cent of GDP in 2012-2013. This fall in gross domestic savings has come about because of a dramatic fall in household financial savings. Household financial savings is essentially a term used to refer to the money invested by individuals in fixed deposits, small savings schemes of India Post, mutual funds, shares, insurance, provident and pension funds, etc. A major part of household financial savings in India is held in the form of bank fixed deposits and post office small savings schemes. Between 2005-2006 and 2007-2008, the average rate of household financial savings stood at 11.6 per cent of the GDP. In 2009-2010, it rose to 12 per cent of GDP. By 2011-2012, it had fallen to 7 per cent of the GDP. The household financial savings in 2014-2015, stood at 7.5 per cent of GDP. Chances of this figure having improved in 2015-2016 are pretty good given that a real rate of return on deposits is on offer for savers, after many years. If a programme like Make in India has to take off, India’s household financial savings in particular and overall gross domestic savings in general, need to be on solid ground. And that is only going to happen if people are encouraged to save by ensuring that they make a real rate of return on their deposits. In fact, if India needs to grow at 10 per cent per year, an estimate made in Vijay Joshi’s book India’s Long Road suggests that the savings rate will have to be around 41 per cent of the GDP. The point is that a scenario where a positive real rate of return is available to depositors is very important. But is that how things will continue to be? Take a look at the following chart, which plots the repo rate and the consumer price inflation. As can be seen from the graph, the difference between the repo rate (the orange line) and overall inflation (i.e. 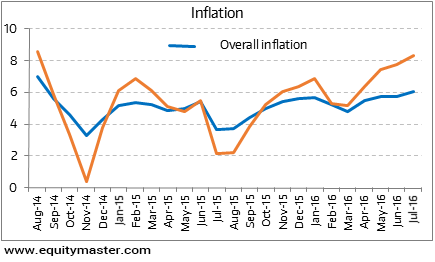 inflation as measured by the consumer price index) has narrowed considerably and is at its lowest level in the last two years. This effectively means that the real rate of return on fixed deposits offered by banks has been falling as the rate of inflation has been going up. (Ideally, I should have taken the average rate of return on fixed deposits instead of the repo rate, but that sort of data is not so easily available. Hence, I have taken the repo rate as a proxy). This is not a good sign on several counts. In a country like India where deposits are a major way through which people save, high inflation leading to lower real rates of interest which effectively means that they are not saving as much as they should. This is something that most people do not seem to understand. Now replace China with India in the above paragraph and the logic remains exactly the same. Given that a large portion of the Indian household financial savings are invested in bank deposits, any fall in interest rates (as the corporate chieftains regularly demand) should make people feel poorer and in the process negatively impact consumption, at least from the point of savers. Given this, the biggest challenge for Urjit Patel will be to not taken in by all these demands for lower interest rates and ensure that the deposit holders get a real rate of interest on their fixed deposits. Further, it is unlikely that he will cut the repo rate given that as the monetary policy committee comes in place, the RBI needs to maintain a rate of inflation between 2 to 6 per cent. In July 2016, the rate of inflation was over 6 per cent. Does the Food Security Act Really Offer Food Security? The National Food Security Ordinance (NFSO),8 2013 was promulgated on July 5, 2013. A little over two months later, the National Food Security Act (NFSA) was enacted on September 10, 2013. Given this, it has taken the states nearly three years to implement the Act. The Food Security Act offered food security by freezing the price of rice, wheat and coarse cereals at the central issue prices of Rs 3, Rs 2 and Re 1, respectively, for a period of three years, up to July 2016. The targeted public distribution system forms the largest component of the Food Security Act. In fact, there are two types beneficiaries under the targeted public distribution system. There are those who come under the Antyodaya Anna Yojana (AAY) and then there is something termed as priority households. The AAY was launched in December 2000 and it aims to reduce hunger among the poorest of the poor. Priority households on the other hand includes all families which come under the below poverty line. The broader definition of the priority households has been left to the state governments. As far as entitlements go, every AAY household is entitled to 35 kg of food grains every month. Those coming under priority households are entitled to 5 kg per person of food grains every month. Close to 12.2 crore individuals come under AAY whereas 69.3 crore individuals come under priority households. Nearly three years after the Food Security Act was passed, a question worth asking is, does it really offer food security to the citizens of this country? The Food Security Act largely focusses on making food grains available to the citizens of this country at a rock bottom price. In order to support the ambitious coverage of the Act (nearly 81.5 crore individuals or two-thirds of the country’s population as per 2011 Census), the government has to acquire a large amount of rice and wheat through the Food Corporation of India as well as other state procurement agencies. This has an unintended consequence. Simply stated, the law of unintended consequences refers to a situation where economic decisions have unexpected effects. And what is support reversal? “The average cereal consumption in India is 10.6 kgs per person per month (NSSO, 2011), and NFSA supplies nearly half of it (5 kgs per month per person, except for those under the AAY who have a family entitlement of 35 kgs per month). People go to the open market to buy their remaining cereal requirements. However, with the government mopping up the supply of cereals, the open market is left with less causing an upward stickiness in prices,” write Saini and Gulati. Even for those coming under AAY, the NFSA doesn’t supply enough food grains. Assuming five people per household, the average individual entitlement comes to 7 kgs per month, which is lower than the average cereal consumption of 10.6 kgs per month. The point being that even though the idea behind the Food Security Act is to provide food security by selling food grains at a very low price, it makes things a little difficult by pushing up prices of food grains. Further, one needs to take into account the fact that food grains are not the only thing that people are eating in order to survive. The government offers a minimum support price at which it buys rice and wheat from farmers. This helps on two counts. One is that it encourages farmers to grow rice and wheat, knowing well in advance what price they can sell it at. Further, the government buys rice and wheat to create a buffer stock in order to support the food security programmes, as well as maintain food security of the nation. This essentially means that even though the Food Security Act wants to help people by selling rice and wheat at a low price, it ends up creating a difficult situation because prices of other crops tend to go up, as farmers tend to concentrate on buying rice and wheat. 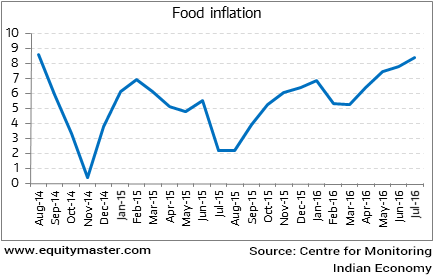 Food inflation in June 2016 was at 7.79 per cent. Within food, vegetables, pulses and sugar, saw an increase in price of 12.72 per cent, 28.28 per cent and 12.98 per cent, respectively. Spices went up by 8.13 per cent. Hence, the unintended consequence of the Food Security Act is to make things more expensive on the whole. What is the way around this? I shall discuss some solutions in the weeks to come. The Reserve Bank of India(RBI) governor Raghuram Rajan has often been accused of not cutting the repo rate fast enough and in the process hurting economic growth. Repo rate is the interest rate at which RBI lends to banks. The hope is that once the RBI cuts the repo rate, banks will cut their lending rates as well. In the process people will borrow and spend and economic growth will return. The Rajan led RBI started cutting the repo rate from January 2015 onwards. Between then and now it has cut the repo rate by 150 basis points, from 8 per cent to 6.5 per cent. One basis point is one hundredth of a percentage. Also, the rate of inflation in January 2015 was at 5.19%. Since then it has risen by 58 basis points to 5.77% in June 2016. During the same period, the repo rate has been cut by 150 basis points. So the RBI has cut the repo rate despite, the rate of inflation going up. Hence, the question is, how has it been slow in cutting the repo rate? People who make such arguments, typically do not look at numbers and say things for the sake of saying them. In 2007-2008, things were going well for India. The gross domestic product(GDP) grew by 9.2 per cent. The fiscal deficit was at 2.54 per cent of GDP. The inflation was at 6.2 per cent. Then the financial crisis struck in 2008-2009. The government decided to tackle the slowdown in growth by increasing its expenditure. In the process the fiscal deficit went up as well. Fiscal deficit is the difference between what a government earns and what it spends. The fiscal deficit reached 5.99 per cent of the GDP. Next two financial years the economic growth crossed 8.5 per cent. The rate of inflation also entered double digits. The extra expenditure did manage to create growth, but it also created inflation. This ultimately caught up with economic growth. The economic growth fell to below 5% levels in 2012-2013 and 2013-2014. Hence, high inflation ultimately caught up with growth. But it did create growth for two years and during that period the Manmohan Singh government looked good. In fact, if the Lok Sabha elections were around that period, the Congress led United Progressive Alliance would have done much better than it eventually did. The larger point is that any government has only got a period of five years to show its performance and in that period it has to do whatever it takes. If that means turning on inflation to create growth, then so be it. The trouble is that once you get inflation going, it is very difficult to control, as we clearly saw between 2007-2008 and 2013-2014. But the lessons of that are still not appreciated. While, inflation ultimately catches up with economic growth, it ends up helping the government in another way. The government finances its fiscal deficit by borrowing. When it borrows the absolute level of government debt goes up. Despite this, government debt expressed as a proportion of the gross domestic product, might come down, because the GDP in nominal terms is growing at a faster pace than the debt, due to high inflation. Due to inflation, the nominal GDP (which is not adjusted for inflation like real GDP, and against which total debt is expressed) went up at a much faster pace than the total debt of the government. This led to government debt expressed as a proportion of GDP falling. Given this, there is more than one reason for the government to love inflation.